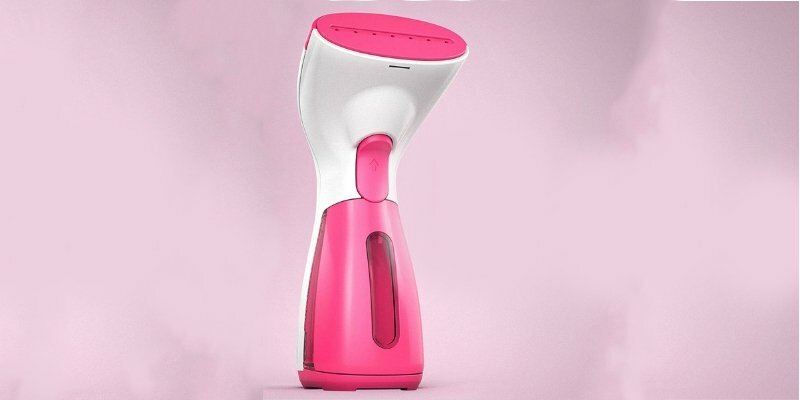 Why do you need travel steamer? How to use travel steamer? What kind of water should I use for a travel steamer? How to clean travel steamer? What is the best travel steamer? We travel for various reasons. But it doesn’t matter if it’s for business or pleasure. One thing is sure: it always feels good to look good. Imagine hiking wearing that spotless wrinkle free t-shirt… mm. Or dining out and impressing all the people around by your flowy, silky dress. But who loves ironing, anyway? For years I’ve been purchasing new irons, over and over. Thinking that the previous one probably wasn’t powerful enough, that’s why I could have spent 30 minutes on one shirt, and it still looked pretty much the same as before I started. That was so annoying. Thankfully I’ve discovered the magic kingdom of steaming, and currently, I am a proud owner of three wonderful portable steamers, and I am not sure how I lived without it before. I appreciate the possibility to look nice while I am stumbling around from one country to another. And who wouldn’t? So picking the right travel steamer is a pretty big deal if you care about keeping your clothing neat, disinfected and wrinkless. But first things first. Let’s answer the general questions related to this device. Put cold water in the tank of the steamer, but don’t overfill it to avoid the leaking. Check your steamers manual for specific guidelines. Make sure that all the parts are well-connected. Switch on the device on and allow it to heat up until the steam forms. Put the shirt or any other garment you’d like to prettify on a hanger. Steam from the bottom of a garment, moving upward. After you’ve done, let the shirt hang for a minute before putting it in the closet. That will let the dampness to air out. Distilled water is an essential step in routine steamer care. It’s free of contaminants and dissolved salts, so it does not destroy the insides of the gadget. Your steamer is even at a higher risk when you use hard water and forget to discard it after the steaming is done. And even if you stick to distilled water never add starch or similar substances to it, as those will have the same destructive effects as the hard water. If using tap water, the steamer is likely to build-up the calcification from minerals in the water. You’ll know that it’s time to for maintenance when your little helper releases steam more slowly than usual or doesn’t do it at all. To clean the device fill it with the mixture of distilled water and white vinegar (3:1 ratio respectively). Then switch it on and steam half of the liquid. Turn it off and keep it set for half an hour to dissolve the rest of mineral buildups and then discharge the device. And now let’s get into deeper details. It couldn’t be easier to use. Put some water inside, just below the max mark. Plug it in, switch in one and in 60 seconds you are good to go. The full tank lasts for 4-6 minutes of continuous steaming, and it’s enough to unwrinkle, for instance, one blouse of an M size. Can easily be taken along even on short overnight trips. Will start steaming in seconds, unlike iron. It’s safe – not burn hazards. Water storage capacity is a bit small. But the hack is to keep a bottle of water to refill the tank quickly. Takes time to ace using it. Make sure you don’t tilt the steamer, or it will spurt water and leave big wet spots on your clothes. Keeping it upright, or only slightly tilted, ensures you only get steam. With the size of 8*5.5*3.3 inches and around 1lb of weight, this steamer can be your best option when picking the perfect device to get on your trips. The smaller tank is one of the disadvantages of the steamer’s lightweight. On the other hand, it’s working, and it’s compact. And that’s exactrly what you might want from a perfect travel steamer. This product is light, stylish and most importantly breezy to operate! As reported by savvy steamer’s users it’s also very powerful and does its job just GREAT. The tank lasts for a few garments, and you can also use it as a humidifier. The perfect travel steamer that doesn’t leak. Size is small enough for a travel steamer. Provides the right amount of steam to get wrinkles out of clothing. It has a detachable water reservoir, which is super convenient to refill without getting the whole steamer wet. If there is anything to improve in the device itself, it would be to have some cord storage system. This device 9* 6.3* 4.4 inches and weighs 1.55 pounds. It has a cute design. It heats up super fast. It doesn’t spit hot water. Easy to fill. Gets the job done, making your clothing look like it just got taken from the dry cleaner. The best travel steamer considering weight/power ratio. This super powerful but yet small enough to travel steamer will wow you with the quickest heat up time (15s), and 6 to 8 minutes of powerful continuous steam. So when you are in a rush on your trip there would no delays, at least in “making your outfit look stunning” department. The device is equipped with four removable attachments. Those include sweater brush, wool brush, ironing plate, line clip. So it can take care of all kinds of clothes at one time for you and can be even used for dry cleaning. Convenient for travels of any sort. Very safe to use, small and great for storage. It comes with four heads with different functions. So powerful – it will save you hours on ironing. It comes with the travel storing bag. It doesn’t work well on the thick coats. The steamer’s size is 13.7*8.4*5 inches. It weighs 2.62 pounds. It looks beautiful, feels good, takes REALLY good care about your wardrobe and saves you tons of time on ironing during your journeys. This steamer travels well and isn’t too heavy (unless you have water in it, but that should be obvious). Works well and shoots out the perfect amount of steam. Never spurts out water and the lint brush is a lifesaver. Heats up within seconds, and steam for up to 8 minutes continuously! And can steam two men’s dress shirts and a long ladies maxi dress with one full water tank. And it’s designed with travelers in mind as it’s Dual-Voltage (220v and 120v) to work when you are going abroad. It’s very well worth it! Best feature is the bi-volt (110-220v), so it’s super handy for travels. Portable and fits in our suitcase. The quick 45-second heat-up time. It has a very convenient removable water tank. It comes with the travel bag, so you can conveniently carry it with you anywhere. Some users mentioned that the tank could be a bit bigger. It might leak if overfilled even a little. The product measures 5.5*5*10 inches and weighs 2.5 pounds. It’s a perfect dual voltage travel steamer and works well on the different fabrics and even though a bit heavy still fit nicely in any suitcase. (Otherwise, you can purchase lighter steamer + voltage converter, which adds up to the weight anyway).